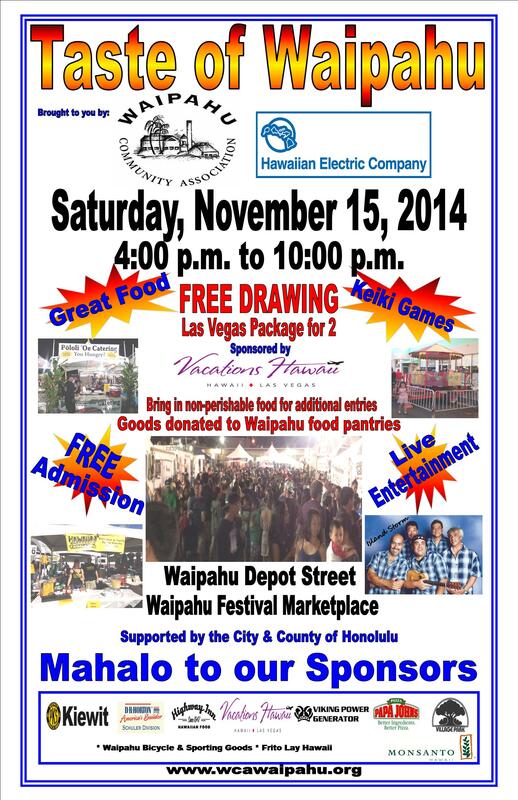 Waipahu Community Association is excited to announce that we will be hosting our 9th Annual Taste of Waipahu Event on Saturday, November 15, 2014. This is a free event and will be held on historical Waipahu Depot Road and in the Waipahu Festival Marketplace parking lot from 4:00p.m. til 10:00p.m. We will be featuring a wide variety of food vendors, crafts, drinks, desserts and all the food cravings you were thinking of including fun for the keiki’s with rides and games! Live entertainment and much, much more! This fun-filled family event will entertain you from beginning to end! For you Vegas lovers, there will be a free drawing to win a trip for two to Las Vegas sponsored by Vacations Hawaii. Combined with our efforts to support our Waipahu area food pantries, we will also be having a food drive. Your participation and donation of canned goods or other non-perishable food items qualify for additional entries—with a maximum of 10 entries including your free entry. Please give and support needy families and enter for a chance for this exciting trip giveaway. Please feel free to visit our website www.wcawaipahu.org or call 677-6939 for more information. You don’t want to miss out on this fun event!